Liam’s Map ended his career with a scintillating performance in Friday’s $1,000,000 Breeders’ Cup Dirt Mile (G1) at Keeneland. Normally a frontrunner, the colt found himself stuck behind horses with nowhere to go down the backside after a slow start. However, his class took over when they turned for home and won like a 1/2 shot should while breaking the track record under Javier Castellano. West Point Thoroughbreds was fortunate enough to acquire an interest in the the 4-year-old Todd Pletcher trainee from majority owners Teresa and Vincent (Vinnie) Viola following two huge races at Saratoga over the summer. Vinnie and West Point president Terry Finley have been friends for years, and are both graduates of the United States Military Academy at West Point. Liam’s Map is named after Liam Collins, one of the first American special operations soldiers to arrive in Afghanistan after September 11, 2001. 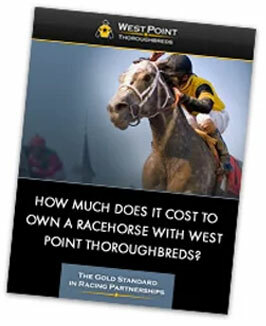 Immediately after the Violas purchased a handsome grey son of Unbridled’s Song as a yearling, they knew they wanted to pay tribute to a great American hero and former director of the Combating Terrorism Center (CTC) at West Point. When Collins retired from his position as director of the CTC to become a professor at West Point, he presented Vinnie with a very special gift, his Afghanistan survival map. Each special-ops soldier carries a silk survival map of the area that can mean the difference between life and death when in the field. "It was a map that I jumped into Afghanistan with," Collins said. "We jumped into Afghanistan in November of 2001. I explained what it was, kind of a silky map that you could take with you. You could use it if you have to escape and evade. It's serial-numbered. So if it got separated from you, you would know whose it was and where they'd been." "This win is dedicated to every serviceman and servicewomen, especially the Special Forces," Vincent Viola said in a post race interview. "I wished today for every young boy who attends the races with his dad like I did, that they could share and experience these feelings that I am [feeling] today. I wish for that for every young American son and daughter, quite frankly. Every daughter and son." On Sunday morning, Liam’s Map shipped a few miles down the road to Lane’s End Farm, where he will begin his career as a stallion in 2016.